For quantitative determination of glyoxalase activity. Note: use a UV plate (e.g. 96-well UV plate, cat# P96UV). • Fast and sensitive. Linear detection range (20 µL sample): 0.4 to 80 U/L for 30 min reaction. Detection Limit of 0.1 U/L for 120 min reaction. GLYOXALASE I (GLO-1), a lactoylglutathione lyase also known as methylglyoxalase, aldoketomutase, ketone-aldehyde mutase, and (R)-S-lactoylglutathione methylglyoxal-lyase, is an enzyme that catalyzes the isomerization of hemithioacetal adducts which are formed in spontaneous reactions between glutathionyl groups and aldehydes. The primary physiological function of glyoxalase I is the detoxification of methylglyoxal, a reactive 2-oxoaldehyde that is cytostatic at low concentrations and cytotoxic at millimolar concentrations. Glyoxalase I is a target for the development of pharmaceuticals against bacteria, protozoans and human cancer. Simple, direct and automation-ready procedures for measuring GLO-1 activity in biological samples are highly desirable in research and drug discovery. 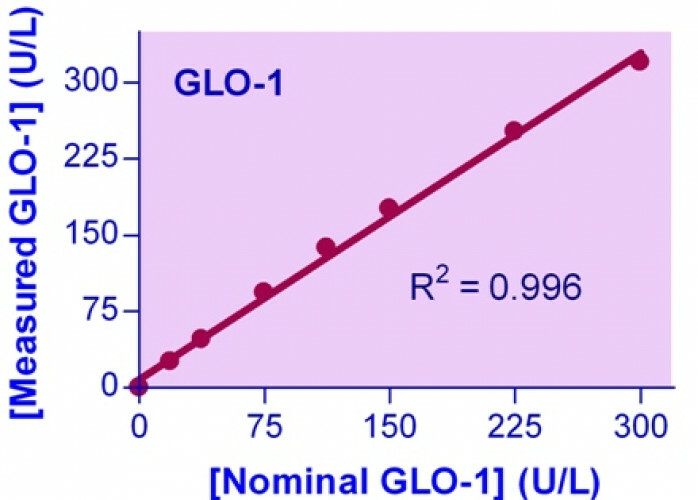 BioAssay Systems’ Glyoxalase I assay kit provides a sensitive and convenient method for GLO-1 activity determination. 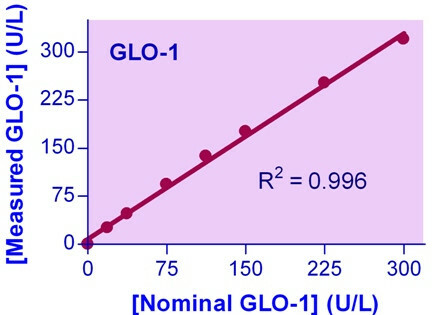 The method involves monitoring the increase in the product of the GLO-1 reaction, S-lactoylglutathione, by measuring the change in absorbance at 240 nm. Applications For quantitative determination of glyoxalase activity. Note: use a UV plate (e.g. 96-well UV plate, cat# P96UV).